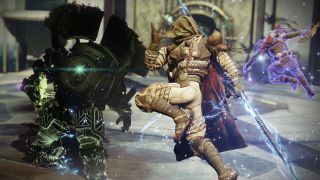 With just two weeks standing between Destiny 2 players and both the Season of the Drifter and its Joker's Wild annual pass DLC, Bungie has finally spilled the beans on (some of) the balance changes coming on March 5. According to the latest This Week At Bungie blog post, the next season will make sweeping changes to Gambit and shotguns, with minor changes coming to linear fusion rifles and the infamous One-Eyed Mask Exotic. Let's start with Gambit, seeing as how it's a key part of Joker's Wild. Presumably in response to Gambit feedback collected earlier this year, blockers will be rebalanced to make saving Motes of Light more worthwhile. As of March 5, small blockers will be Taken Goblins with less health than the old Taken Phalanxes; medium blockers will be Taken Captains with more health than the old Taken Knights; and large blockers will be Taken Knights with more health than the old Taken Ogres. Taken Knights always felt like the most bang for your buck, so this sounds like a good change in theory. The other big Gambit change has to do with match length. Countless players suggested shortening three-round games by turning the tie-breaker into a race to burn the Primeval, and that's exactly what Bungie's doing. When Gambit matches go to round three, the Primeval will spawn at the start of the round, which will hopefully "speed up Gambit matches overall and add a change of pace to the final round." Smaller Gambit changes include improved and increased Invader spawn points, and an idle protection system which will ensure inactive players don't receive any rewards. No word on improving end-of-match rewards just yet, but perhaps Joker's Wild or other parts of the Season of the Drifter will help on that front. These Gambit changes dovetail nicely with the balance change coming to linear fusion rifles. As it turns out, the Queenbreaker Exotic which has terrorized Gambit for months was accidentally given "over double the intended aim assist," so it's finally getting nerfed. Linear fusions as a whole are also getting their aim assist turned down, but will receive a 10 percent PvE damage buff to compensate. Shotguns are getting hit much harder than linear fusions. For starters, the rate-of-fire boost granted by the Full Auto perk that's dominated PvE since year one of Destiny 2 is being reduced from 100 percent to just 10 percent on shotguns. Shotguns of all archetypes will receive rate-of-fire boosts and significant PvE damage boosts to compensate for this, but they're also getting their ammo reserves toned down. Effective shotgun range is also being slightly reduced in the Crucible. In other words, it might be worth using something other than a shotgun again. To round things out, Bungie announced the One-Eyed Mask nerf that players have been requesting ever since the Exotic was released. The duration of the Mask's wall-hack Vengeance effect is being reduced from 15 seconds to eight seconds, and it will no longer trigger during Supers. Additionally, the health it provides on Vengeance kills will now recover over time rather than regen instantaneously. One-Eyed Mask will still be strong after this nerf, but it should at least be reasonable. Read up on everything coming in Destiny 2 Season of the Drifter in our roundup.